WISE READING® Remediation Workshop for Educators: Now in Webinar Format! Evoke Learning is currently recruiting grade 1-12 math, science and English tutors, for both immediate and future needs. 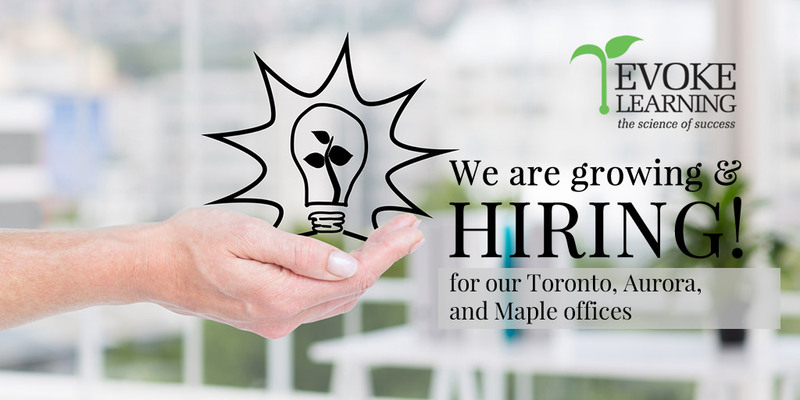 Positions are available in our all three locations; Toronto, Maple, and Aurora offices. Evoke Learning offers academic coaching, mentoring, and tutoring services for students. We also specialize in working with students with learning exceptionalities, those undergoing transitions, and who are trying to manage an athletic/academic balance. Our evidence-based, holistic approach to tutoring, mentoring, and coaching serves an expanding educational niche with unparalleled expertise and a high success rate. Our tutors, mentors, and coaches, are dedicated to creating a student-centred support model using holistic, research-based approaches. The Evoke network is a family that puts students first. If you’re invested in student success, you’ll enjoy being part of our team.